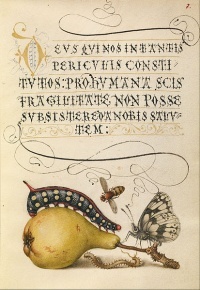 Fly, Caterpillar, Pear, and Centipede from the Mira Calligraphiae Monumenta by Joris Hoefnagel. The so-called "Flemish Primitives" were the first to popularize the use of oil paint. Their art has its origins in the miniature painting of the late Gothic period. 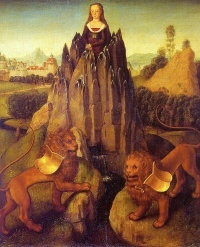 Chief among them were Jan van Eyck, Hans Memling, Hugo van der Goes and Rogier van der Weyden. During the late Middle Ages Flanders' trading towns (notably Ghent, Bruges and Ypres) made it one of the richest and most urbanised parts of Europe, weaving the wool of neighbouring lands into cloth for both domestic use and export. As a consequence, a very sophisticated culture developed, with impressive achievements in the arts and architecture, rivalling those of Northern Italy. From the early 16th century, the Italian Renaissance started to influence the Flemish painters. The result was very different from the typical Italian Renaissance painting. 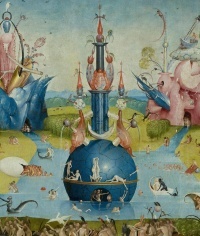 The leading artist was Pieter Bruegel the Elder. Other famous names in this classic tradition are Jan van Eyck, Peter Paul Rubens and Anthony van Dyck. This rich artistic production, often referred to as a whole as Flemish art, gradually declined during the second half of the seventeenth century. One hallmark of the Reformation was the belief that excessive commemoration of the saints and their images had become idolatry. Efforts to end it led to the iconoclasm of 1566 (the Beeldenstorm) – the demolition of statues and paintings depicting saints. This was associated with the ensuing religious war between Catholics and Protestants, especially the Anabaptists. The Beeldenstorm started in what is now the arrondissement of Dunkirk in French Flanders, with open-air sermons hagepreken) . The first took place on the Cloostervelt near Hondschoote. The first large sermon was held near Boeschepe on July 12, 1562. These open-air sermons, mostly of Anabaptist or Mennonite signature, spread through the country. 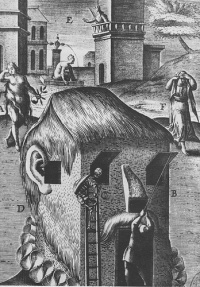 On August 10, 1566 at the end of the pilgrimage from Hondschoote to Steenvoorde, the chapel of the Sint-Laurensklooster (Monastery of Saint Lawrence) was defaced by Protestants. The iconoclasm resulted not only in the destruction of Catholic art, but also cost the lives of many priests. It next spread to Antwerp, and on August 22, to Ghent. One cathedral, eight churches, twenty-five cloisters, ten hospitals and seven chapels were attacked. From there, it further spread east and north, but in total lasted not even a month. After the Siege of Antwerp (1584-1585), the Southern Provinces of the Netherlands ("Flanders") remained under Spanish rule and were separated from the independent Dutch Republic. 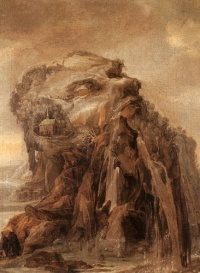 Although many artists fled the religious wars and moved from the Southern Netherlands to the Dutch Republic (see Dutch Golden Age painting), Flemish Baroque painting flourished, especially in the Antwerp school, during the seventeenth century under Rubens, Anthony van Dyck, and Jacob Jordaens. Following the deaths of major artists like Rubens in 1640 and the end of the Eighty Years' War in 1648, the cultural significance of Flanders declined. A revival of painting in this region came only after the Belgian Revolution of 1830. Painters from this period are categorized as Belgian rather than Flemish (see List of Belgian painters). Although James Ensor stood apart from his contemporaries, this innovator in 19th-century art significantly influenced expressionist and surrealist painters of the 20th century. Of the expressionist (i.e. the second) 'Group of Latem', Permeke is generally best known, and for more than four years his face was most prominent on the last banknote of 1,000 Belgian francs — as a 20 Euro bill took over its role. 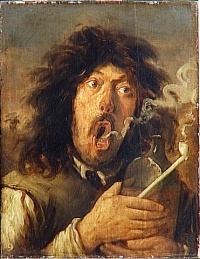 Antwerp had an artistic reputation in the 17th century, based on its school of painting, which included Rubens, Van Dyck, Jordaens, the two Teniers and many others. 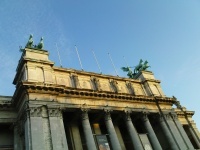 One of the most impressive museums in Belgium , the The Royal Museum for Fine Arts, in Antwerp has an admirable collection of works by Peter Paul Rubens. The Royal Museums of Fine Arts of Belgium is one of the most famous museums in Belgium. The Royal Museum contains over 20,000 drawings, sculptures, and paintings, which date from the early 15th century to the present. The museum has an extensive collection of Flemish painting, among them paintings by Breughel and Rogier van der Weyden, Robert Campin (the Master of Flémalle), Anthony van Dyck, and Jacob Jordaens. The museum is also proud of its "Rubens Room", which houses more than 20 paintings by the artist. The Groeningemuseum is a municipal museum of Bruges, Belgium. Important museums in Ghent are the Museum voor Schone Kunsten (Museum of Fine Arts), with paintings by Hieronymus Bosch, Jean Fouquet, and many Flemish masters; the SMAK or Stedelijk Museum voor Actuele Kunst (City Museum for Contemporary Art), with works of the 20th century, including Joseph Beuys and Panamarenko; and the Designmuseum. The Huis van Alijn (House of the Alijn family) was originally a beguinage and is now a museum for folk art. Unless indicated otherwise, the text in this article is either based on Wikipedia article "Flemish art" or another language Wikipedia page thereof used under the terms of the GNU Free Documentation License; or on original research by Jahsonic and friends. See Art and Popular Culture's copyright notice. This page was last modified 16:43, 20 January 2014.